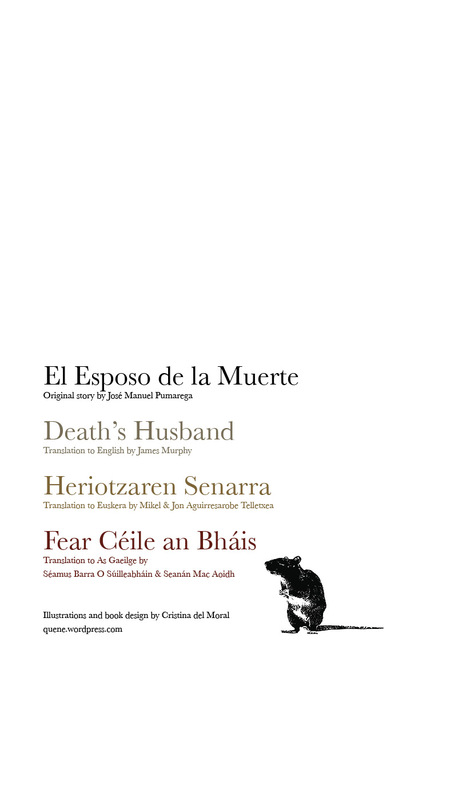 El Esposo de la Muerte – Death’s Husband illustrated short story book. 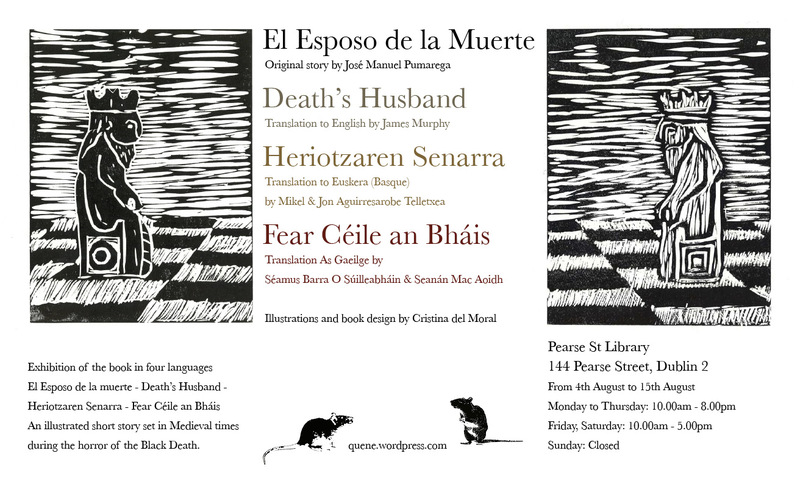 El Esposo de la Muerte/ Death’s Husband / Heriotzaren Senarra / Fear Céile an Bháis is an illustrated short story set in Medieval times during the horror of the Black Death. 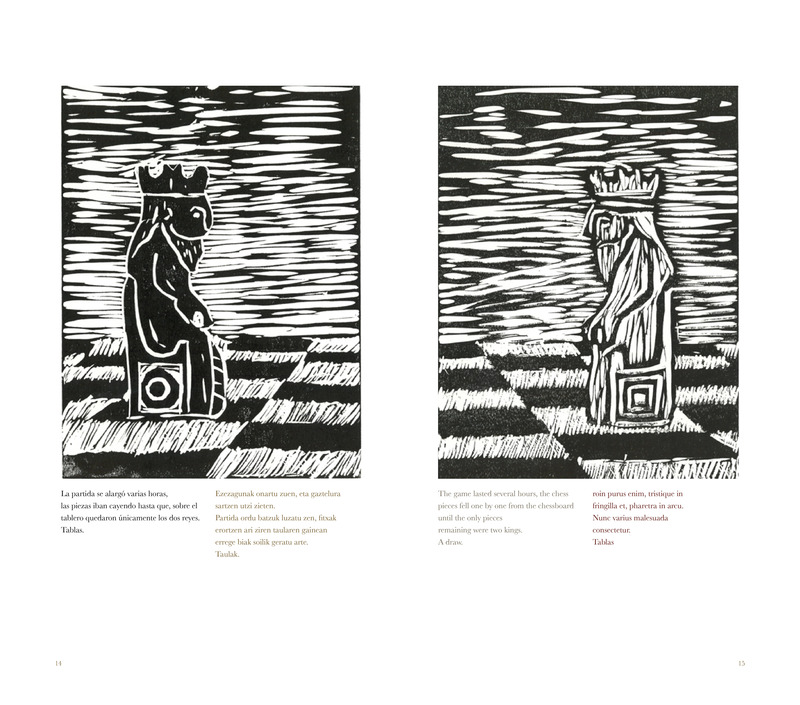 The original story was written in Spanish by J. M. Pumarega and translated into English, Irish and Basque. The languages are set in a layout echoing the Rosetta Stone, highlighting the importance of linguistic diversity. The Illuminated Manuscripts were a source of inspiration. 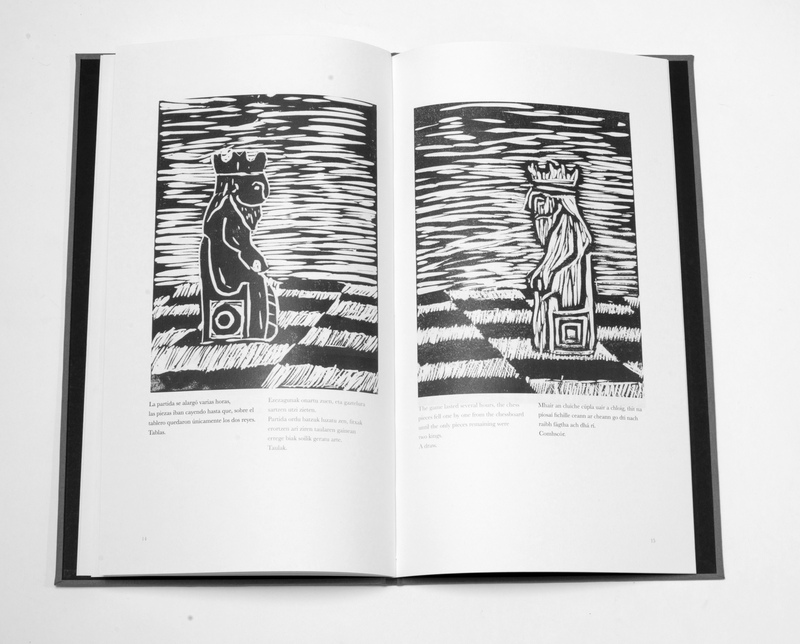 Symbolic hand-printed linocut illustrations in monochrome reflect the dark narrative of the chilling story which won a Mention in the Metrovias Short Horror Story competition in Buenos Aires 2005. 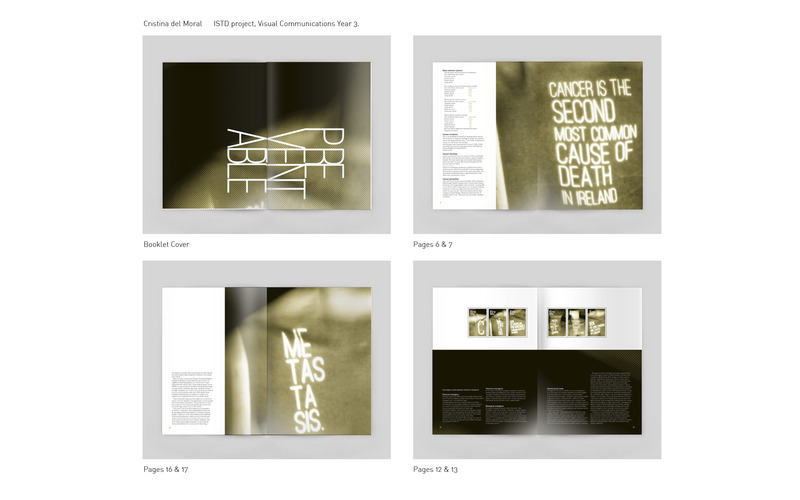 The book and prints were exhibited at the Dublin Institute of Technology graduation show opening 5th June 2015 in DIT Grangegorman. 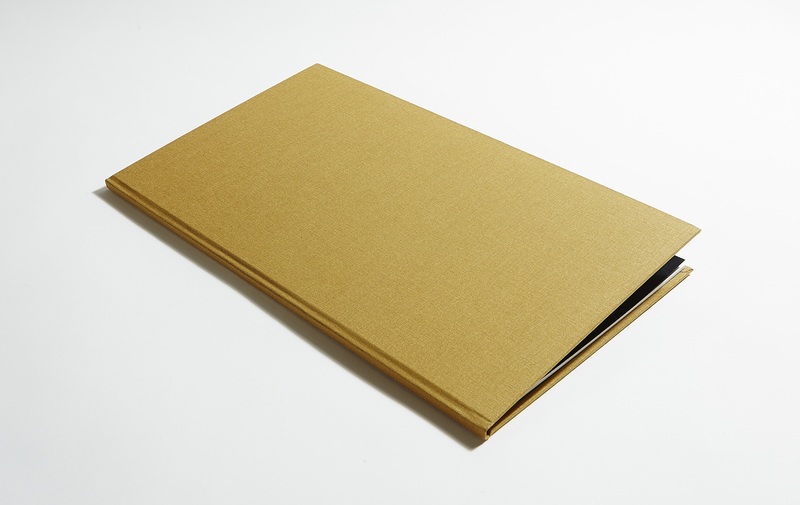 Currently the book is exhibit at Pearse st Library until the 15th of August, the book will be read in four languages Monday 10th of August 6-8pm with pintxos and drink. 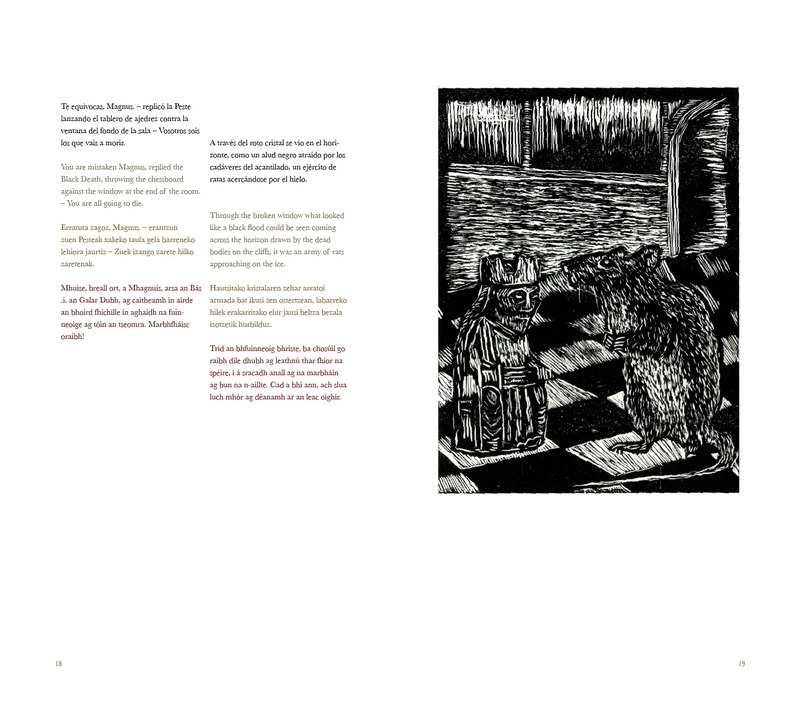 The original story is in Spanish written by José Manuel Pumarega, for the book it was translated into English by James Murphy, Basque/ Euskera by Mikel & Jon Aguirresarobe Telletxea by and Irish/as Gaeilge by Séamus Barra O Súilleabháin & Seanán Mac Aoidh. 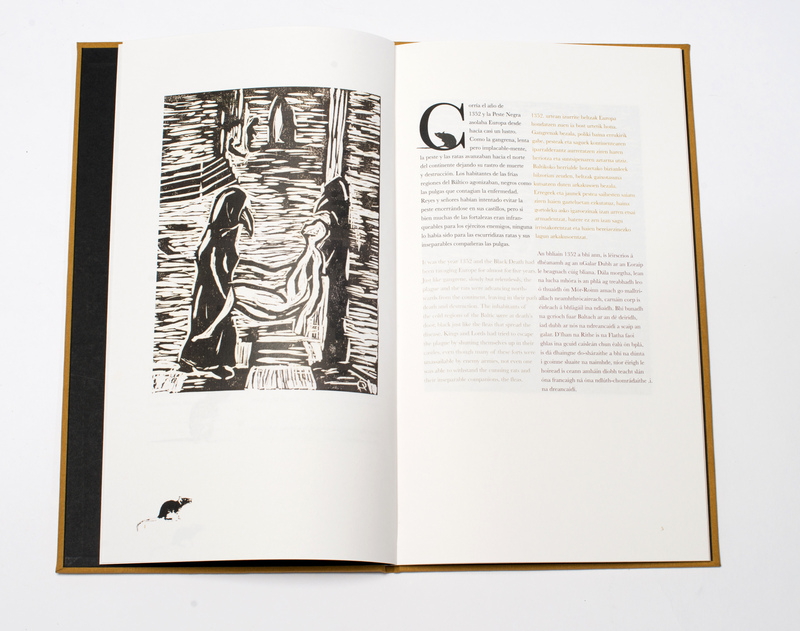 The inspiration was the illuminated manuscripts but monochrome to keep it as dark as the story it self. This is the story of Magnus Gronker a tyrant, monstrous man, who lived in a island Gotland very intelligent who like to play chess. As winter approached and the rats and the plague were moving closer, some of the lords who ruled the shores of the Baltic Sea decided to set sail for Gotland. Magnus Gronker challenged each newcomer to a game of chess, if the newcomer managed to win, he could stay on the island with his subjects, but if he lost, he along with all his subjects would be thrown from the cliffs. He won all the games and they were thrown to the cliffs. A week after the sea had frozen over and the island appeared lifeless, a sled pulled by eight grey wolves arrived in Gotland. It was driven by a slender man, accompanied by a beautiful woman with black hair. The stranger asked for refuge in the castle. They played chess for several hours A week after the sea had frozen over and the island appeared lifeless, a sled pulled by eight grey wolves arrived in Gotland. It was driven by a slender man, accompanied by a beautiful woman with black hair. The stranger asked for refuge in the castle. Until the only pieces remaining were two kings. A draw. Magnus Gronker then got up from the table and said to his opponent: “I win my friend. You will die and your wife will be my slave.” You are mistaken Magnus, replied the Black Death, throwing the chessboard against the window. 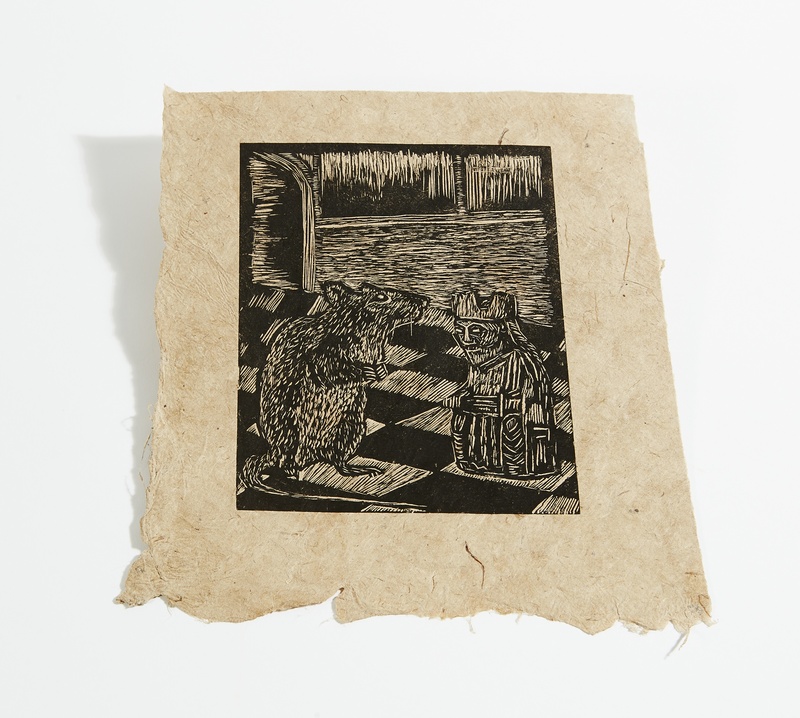 Through the broken window what looked like a black flood could be seen coming across the horizon drawn by the dead bodies on the cliffs, it was an army of rats approaching on the ice. 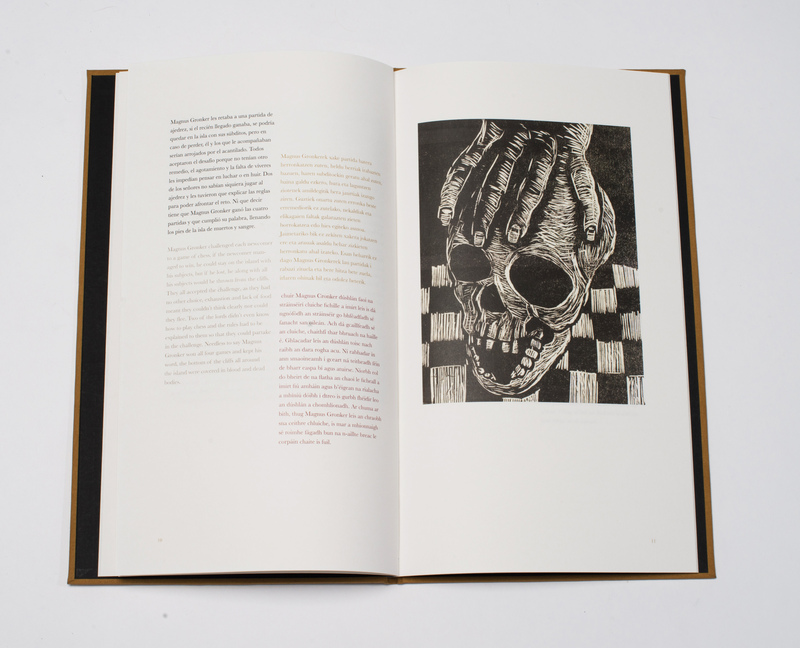 This entry was posted in Graphic Design and tagged black death, book, collaboration project, Cristina del Moral, esuskera, Heriotzaren Senarra, Illuminated Manuscripts, illustrations, J. M. Pumarega, James Murphy, Jon Aguirresarobe Telletxea, Jose Manuel Pumarega, king, linocut, Magnus Gronker, medieval, middle ages, Mikel Aguirresarobe, modern literature in Irish, plague, Quene, Rosetta Stone, Séamus Barra O Súilleabháin, Seanán Mac Aoidh, skull, the Black Death. Bookmark the permalink. Te felicito por el libro Cómo y dónde lo has editado? o es solo una muestra? en cualquier caso ejhorabuena.